a few months after starting this blog i was called to be the primary music leader in my ward. so since then i’ve posted several things i’ve done for music time with the hope that there would be another music leader out there who might happen across my blog and find an idea or two that they could then use in their primary. well, as it turns out, there are many more music leaders coming across my blog than i had anticipated! and since i know that this calling can be somewhat challenging (due to the fact that you have to have something prepared every. single. week.) 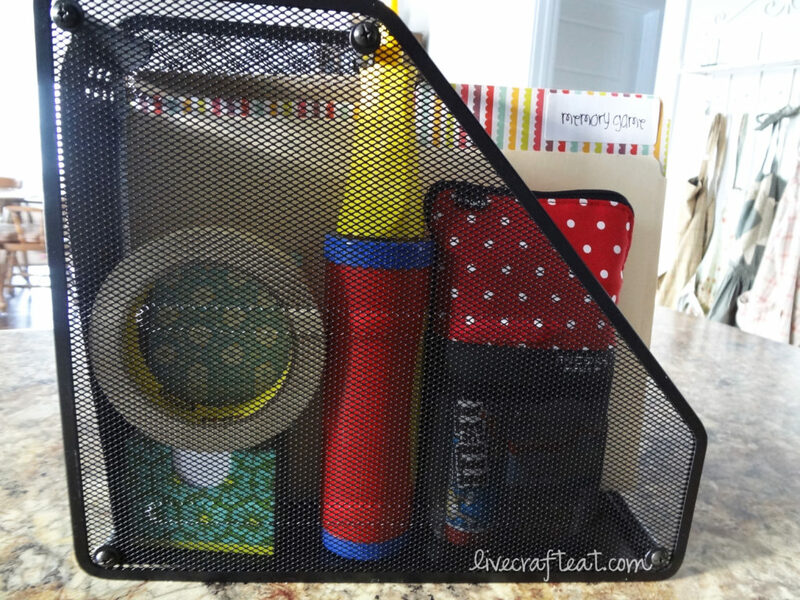 i thought i would share how i keep a few things together so that i can feel a little bit better prepared and not so overwhelmed! 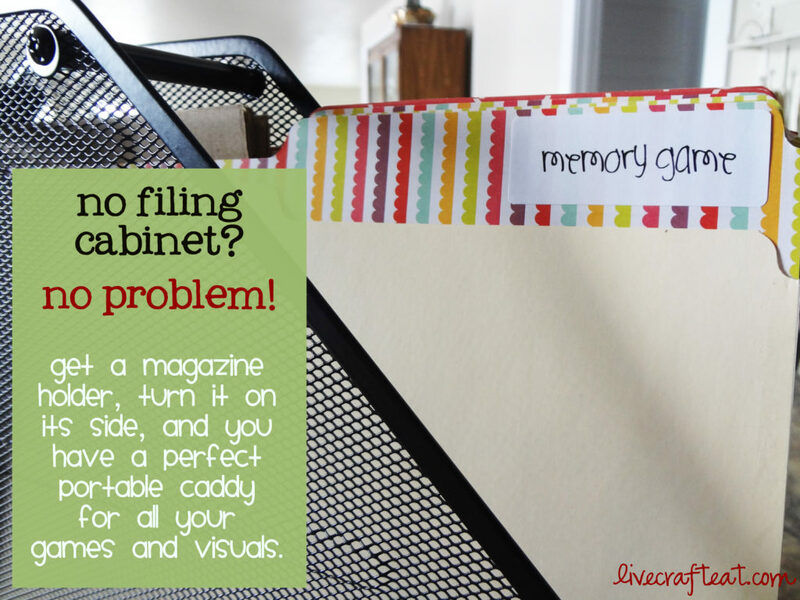 1. the first thing i did was to get a magazine holder and flip it onto it’s side. now it’s a portable file folder holder! 2. the second thing i did was to get a bunch of file folders. (learn how to line file folders here.) i taped up the sides so nothing would fall out. then i put a label on each folder – each activity gets its own folder. 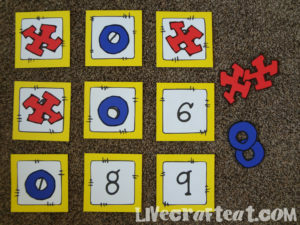 –tic tac toe game: this game is great if your primary kids like a little competition. but if that doesn’t go over well with your group, make it a group effort and see how many times/ways they can get three in a row. my folder includes: tic tac toe numbers 1-9, x’s and o’s, post-it notes to easily exchange the questions/songs on the back of the numbered cards, instructions in the event i need a substitute. –where’s the note? : this one’s really fun. and you don’t even need to download this note (but’s it’s nice to have on hand). 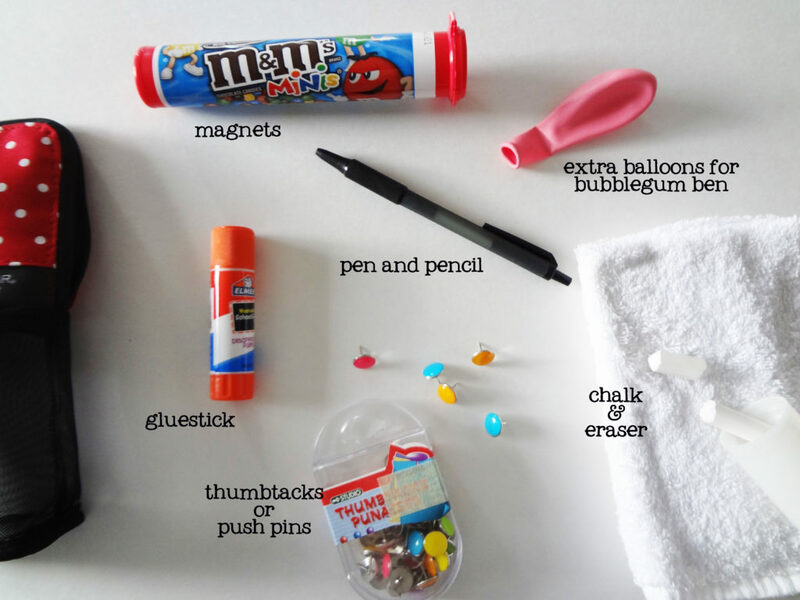 all you need is “something” to hide in the room – a picture, a plastic easter egg, a christmas ornament, etc. even your car keys would work in a pinch! but if you were to have something flat that would store in a file folder, you know you’ve got something ready if you need it. my folder includes several music notes in varying colors, instructions in the event i need a substitute. 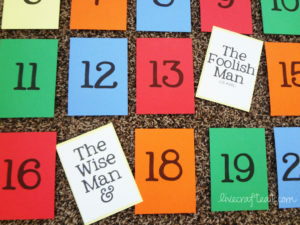 –music time memory game: i have to admit i was a little hesitant to play this game with junior primary…i didn’t know how many matches they’d be able to get (though, of course we would help them out!). but i was pleasantly surprised to find that the juniors are very adept at playing memory even without any help from teachers!! so proud of them! 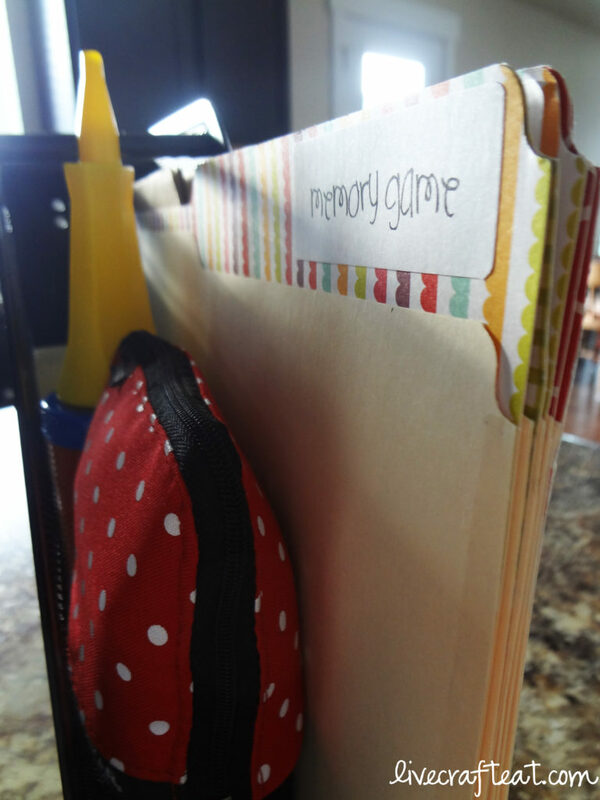 my folder includes: memory cards #1-20, extra pieces of white paper to exchange the songs on the back OR if they’re laminated have a dry-erase marker either in the file folder or in a separate pencil case, instructions in the event i need a substitute. –name that tune! : it’s fun watching their faces when they recognize the first few notes of a song but can’t quite put their finger on what song it is! 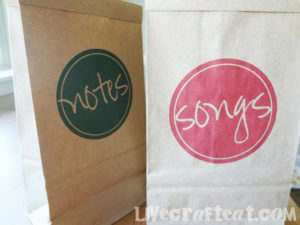 these bags are great for just having them come up and pick a song, too. 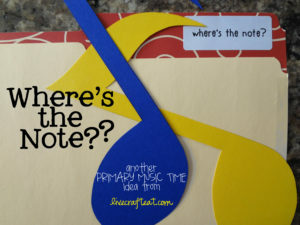 my folder includes: 2 brown paper bags – a “songs” bag as well as a “notes” bag, slips of paper to write down the names of the songs and the number of notes, instructions in the event i need a substitute. –our primary colors: when i first began my role as music leader this time around, i found that not very many of my primary kids knew this song! and after using these visuals only a few times, they already seem to know it pretty well! 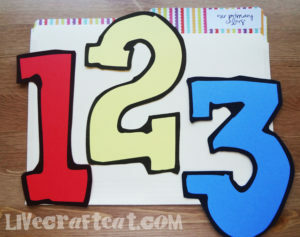 my folder includes: visuals for our primary colors, instructions in the event i need a substitute. 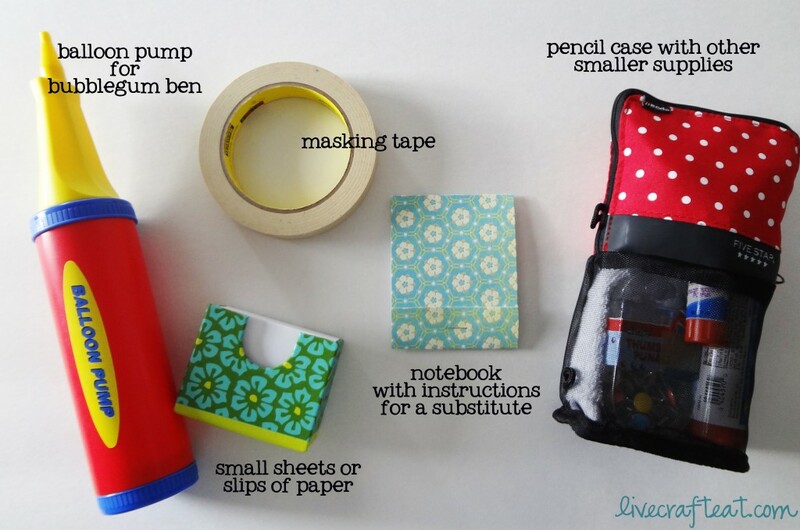 if you always have these things handy (and i’m sure we’ll add more in the future), you can pull off any music time, whether you’ve had time to prepare that week or not. something i did after our primary presentation was to have them play “punch-a-song,” and in each can there was something like, “sing once there was a snowman using ‘where’s the note? '” or “sing a mystery song using ‘name that tune! '” or “sing nephi’s courage using bubblegum ben” etc, rolling all the games they already love into one incredibly fun music time. and you know what? they LOVED it!!! a little bit of initial work makes life so much easier when you have some great resources to draw upon. -chalk and an eraser (i just use a white facecloth so i can wash it if i need to) for playing games like pictionary to get them to guess a song, or for writing the words to a new song on the board and then have them erase the words, one at a time, to try and get them to memorize it. these are most of the games (excluding seasonal) that i have used in music time so far. i’m sure i’ll be adding more to my arsenal in the future, but even if i weren’t to do that for a while, these are a great base for any music time leader. they are versatile and kids love them! 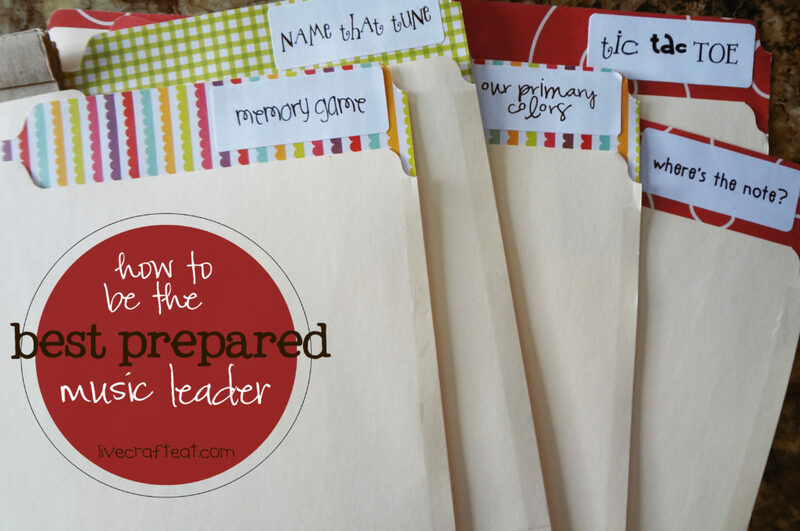 put together these games and supplies, and you are sure to not only have kids cheering when it’s music time, but to also be the best prepared (and least-stressed) music leader out there!! if you have any music time ideas or tips you would like to share, please do so in the comments! i’d love to hear them! almost thou persuadest me to want to be a primary music leader! you’d make a great music leader! You are sure more organized than I ever was. I served for 4 years in this calling. We used to have some fun singing action songs progressively faster and faster. Another thing we did to learn lyrics, usually when I was completely unprepared, was to write them on the chalkboard, then erase a few words each time we would sing it. Thanks so much for sharing this. I love all your ideas! Thanks, Christi! It’s so nice of you to say that 🙂 Glad you like them! This is so awesome! I am an “older” Primary Music Leader (I had this calling for 15 years but about 20 years ago). While I love doing music with the children and do so with enthusiasm, I so do not have these creativity genes you and many others have. So, I am very grateful to people like you who make my calling so much easier by allowing me to benefit from your ideas. Thank you, thank you, thank you! This is the coolest thing ever! I have just been called to be the Primary Music Leader for my ward and I am totally out of my comfort zone. I have not been in a Primary setting in over 9 years and back then it was a Sunbeam Teacher. 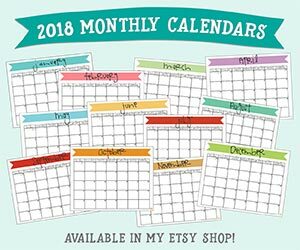 I have been at a loss as to what to plan and how to go about it, this has help put my mind at ease and I am looking forward to using a lot of your ideas. Thank you for posting!! Hi Andrea! That is such a great idea – thanks for the suggestion! 🙂 And thanks so much for visiting my blog!